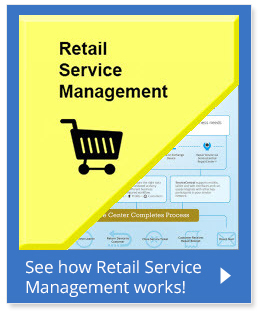 ServiceCentral’s retail service management software solution handles the complexity of customer service operations, giving retailers the ability to better focus on their most important asset: the customer. Our highly customizable solution empowers you to act quickly on the dynamic nature of your business. From configurable workflows and multi-lingual, multi-channel communication to robust security and powerful reporting, our ServiceCentral retail service management software provides a complete end-to-end solution for your after-sales service. Our robust retail customer service software will handle the complexity of your service operations so you can focus on your customer. How will ServiceCentral’s retail solution benefit your customer service center? Configure unlimited workflows, tailoring each service and repair process to match your specific operational needs and eliminate extra work. With ServiceManager™, you have complete control over each screen a user will see, the actions each user can take, and what’s required to move on to the next step. ServiceCentral handles the complexity of determining the available actions at each step in the service process. Whether it's based on product type, warranty status, customer type, or any combination of information, you can build your own set of parameters to ensure a consistent customer experience. With ServiceCentral's Retail Service Management Software Solution, your customers can view the status of their service request at any time using our highly customizable and user-friendly ServicePortals™. These self-service capabilities provide your customers with the information they need when they want it, ultimately improving customer satisfaction and strengthening loyalty. Operate wherever your business takes you with our 100% web-based application and multi-language capability. Our premier hosting facilities ensure operational reliability 24/7/365. We also offer in-house options for hosting. ServiceIntelligence™ reporting gives you a current, comprehensive view of all your service activities. Design, format, and schedule delivery of user-customizable reports to help craft optimized service processes. Dynamic Reports & Dashboards from our retail service management solution provides an easy, accurate read of everything going on.